We like to help our customers when we can. So we offer air duct cleaning coupon specials and discounts. 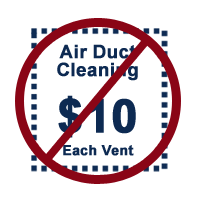 Our dryer vent and air duct cleaning specials and discounts cannot be combined, one offer per customer. These change from time to time, so check back often. we offer a special discount on any of our services. Mention code: MIL2017 when scheduling your appointment. We started this company because we wanted our ducts cleaned before we brought our new baby home. New and Expecting Moms use code: MOM2017 when scheduling your appointment. to all the dust, dirt and allergens from the previous owners. Use code: NEWHOME2017 when scheduling your appointment.